GPO Retro 9401 AM/FM portable radio cassette recorder in silver grey. The gadget of choice for the Retro 1980s lover! Featuring Vintage push buttons for pause, stop/eject, fast forward, rewind, play and record. Retro rotary dial for the tuner and volume. Toggle switches to flick between tape and radio and FM/AM radio functions. Ye olde Retro style extendable arial that clips into place when not in use and a cool carry handle for extra ease of transportation. In the 1980s it was written into law that every home should have one of these cassette recorders in the kitchen and it was also forbidden to enter a construction site without acknowledging the splendour of the obligatory portable tape deck radio through the medium of dance. Them were the days - when hard hats were optional and cassette players were law! 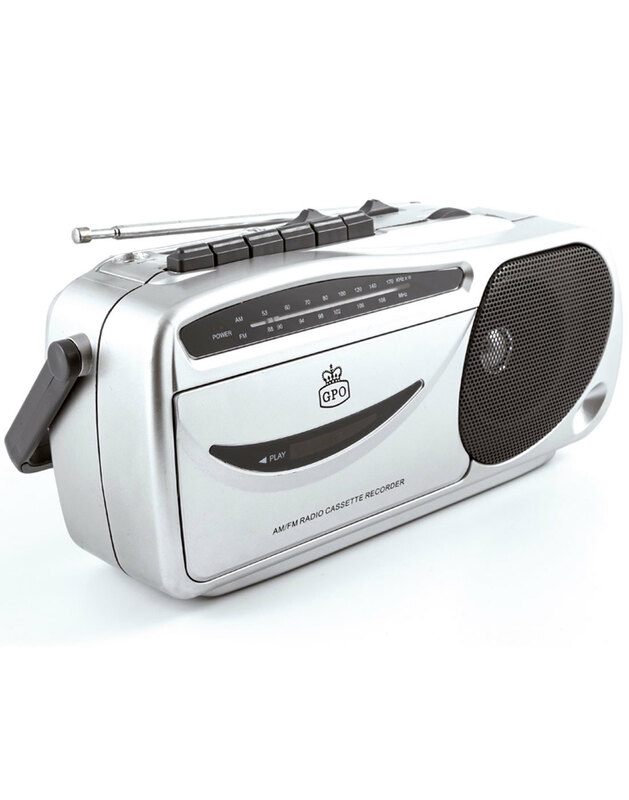 Make for a perfect retro gift idea - The GPO Retro 9401 AM/FM Radio and Cassette Recorder. - GPO Retro 9401 AM/FM radio cassette recorder. - Portable cassette recorderw ith carry handle. - Extendable arial that clips back into place. - Push button function for play, records etc. - Rotary dials for tuning and volume. - Toggle switches for changing between AM/FM and tape/radio functions. - Side loading tape deck. Use the standard Stop/Eject button to change tapes! - Mains or battery powered. - Require 4 x C batteries (not included). W: 21.6cm x D: 9.5cm x H: 11.4cm.